After two-and-a-half years, the music that provided a soundtrack for rebellious-yet-sensitive, coastal-dreaming pop-punk kids of the early 00’s is back. Yellowcard have put the break to rest with the announcement of a brand new record on a newlabel and tearing into life on the road again. 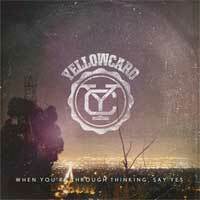 Returning to their pre-major label indie beginnings, Yellowcard have signed with Hopeless Records for their seventh studio album, the first since 2007’s Paper Walls. For round seven (and after 3 million records sold), Ryan Key (vocals/guitar) and original members Sean Mackin (violin) and Longineu (“LP”) Parsons (drums) continuing with Ryan Mendez (guitar) will be joined by longtime friend of the band Sean O’Donnell (bass), whose addition has been described as a “natural fit” for the current mindset and progression of the group.